Bayit Cam Pro HD WiFi Camera Just $64.99! Down From $249.99! 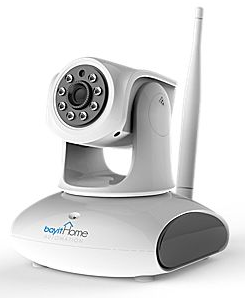 You are here: Home / Great Deals / Bayit Cam Pro HD WiFi Camera Just $64.99! Down From $249.99! Staples has this Bayit Cam Pro HD WiFi Camera on sale for $64.99 (Reg. $249.99) through 5/7! Bayit Cam Pro Full HD 1080P, BH1826, HD 1080P video for crystal clear viewing with bright colors and fluid movement. Night Vision- See whats going on even in the dark. Bayit Cam Pro HD- Keep an eye on your Home or office from anywhere on your mobile device. HD- 1080P video for crystal clear viewing with bright colors, brisk detail and fluid movement. Plug & Play- Download the free Bayit Cam App, plug in the power cord, connect to your Wi-Fi network and start watching in minutes. Pan & Tilt- Control movement of Bayit Cam Pro HD from your mobile device so can get a 360 view all the time.